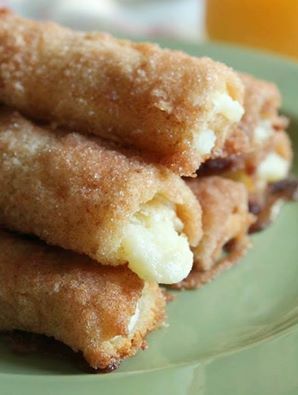 If you want a cheesy snack, you want to try this cinnamon cream cheese rollups. It’s super easy to make and it makes the perfect snack! Check it out. 1 loaf of thin white bread. ⅔ bar of softened cream cheese. To prepare the bread you need to cut off the crust and flatten the bread with a rolling pin. Mix together the cream cheese and powdered sugar in a small bowl until well combined. In a second bowl, mix together the sugar and cinnamon. Now, spread 1-1 ½ tbsps of cream cheese mixture over the bread and roll up. Once you roll all the bread, dip each one into the melted butter and then into the cinnamon and sugar mixture. Arrange on an ungreased cookie sheet and bake in a preheated oven to 350 degrees for 16 to 20 minutes. Easy, peasy and cheesy! These cinnamon cream cheese rollups are perfect for snacks. I usually make them on Sundays’ afternoons. It became a habit. Give it a try, you’ll love it.